I didn’t think so during the game and right after. It only occurred to me that there was a chance she did, when she had scored 4/4 and some other players were complaining, but I considered the probability to be very small. I then looked at her games with some friends of mine from the organization, they were checking with some program if Anna’s moves were matching the (or most of the) suggestions of the engine. It was fairly clear that she was playing her own moves, so my little doubts were even reduced. Have you analyzed the game with an engine afterwards? Not too much, I only checked briefly with the above-mentioned friends. I remember that the engine was suggesting something very different than the game continuation right at the start. Then there were many options, but I don’t think Anna’s moves were matching the computer’s ones “too often”. Do you have the pgn file from the Vandoeuvre open? No, I don’t. To summarize, the game was balanced for the first 25-30 moves, then I lost a pawn in an ending that my opponent duly converted. We were in time-trouble for the last 20 moves or so, and couldn’t leave the table. Although the position wasn’t too difficult at that point, Anna played it faultlessly and earned a deserved point. What do you think about the behavior of the Latvian players? This is a difficult question, because there are obviously two cases. Either they wanted to disturb a young girl, and this is not nice, to say the least, or they really believed Anna was cheating. I don’t know Krivonosov and Starostits very well, but I met the former at Geneva open this year. At some point I found a nice move and won the game. After resigning he complimented me. I know Lazarev a bit more. The fact that he offered a draw so quickly when he met Anna tends to prove that he really believed she got external help. I shall add that some other titled players believed Anna was cheating, and they found it strange that she was “so often” – they said – outside the playing hall. Another argument was that she had dropped some 40 rating points between the July list and the October one (nothing extraordinary when you are young, in my view). All in all I understand their behaviour, even if I don’t share their doubts etc., and think they really believed Anna was cheating. What is more dangerous today, cheating or cheating paranoya? Still cheating, I think, very few players are paranoid about that. 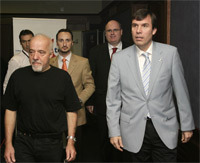 in http://www.fide.com/news.asp?id=1391 . Has it ever happened at other events that you remember? I did it myself to some players (it happened twice or three times, I don’t have so many enemys !) 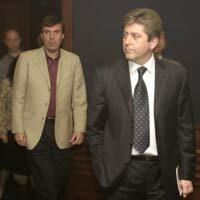 with whom I had had serious problems. In my opinion it is rather extreme, but once again, if you firmly believe someone is cheating, will you shake and with him/her ? 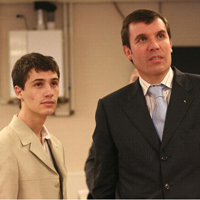 There is a famous story between Shirov and Azmaiparashvili, who met in a closed tournament after Azmai had won many points in a very suspicious way. Shirov is reported to have only shaken hands after Azmai had threatened him. Thank you Mr. Bauer. Would you like to add annything? At the end it was failry evident that Anna Rudolf didn’t cheat, a general opinion that was expressed at the prize-giving by Gerard Simon, the president of Vandoeuvre chess club. She deserved her norms and result after playing such a good tournament. Hi Anton! Thank you very much, it’s an amazing feeling. I’m glad to have achieved the norms and to have played nice games, especially the one against GM Christian Bauer. hinted us that some players were uncomfortable with your strong games? small kid believe such a thing? Yes, ridiculous indeed. I usually went away from the board when it wasn’t my turn to move: I like to go out to the fresh air and also to wash my face. Moreover, I played most of my games on the stage, broadcasted, so I didn’t have to sit at the board to see my position. And yes, the lip balm was always with me. Kids, beware, Rybka is in it! So they were just talking ot they took other actions as well? Marie told us that they will repeat their actions in the next tournament. Yes, I heard about this madness. They know I’m going to play on the Cappelle-la-Grande Open, so Krivonosov promised to accuse me there as well. The tournament hasn’t even started and I’m already cheating! I would like to help Mr Krivonosov’s work and let everybody know that I’m a very evil-minded and dangerous girl, using the strongest engines in the shape of a lip balm! That would be itself a strange situation, as Anna Rudolf has the highest Bucholtz and will win the tournament. However, she has not filed an official complaint because she was not aware of the rule. Can she file one after the tournament is finished? Were there any additional details around the non shaking hands situation? We will get in touch with the arbiter of the competition. Stay tuned for updates!